Today’s gardening gift is one mentioned in previous blogs – giving the gift of bulbs. Not light bulbs but flowering bulbs that provide winter cheerfulness and perk up anyone’s house. It’s a great gift to give to Grandma or that person that doesn’t need a thing. One size fits all. No returns other than blooming flowers. 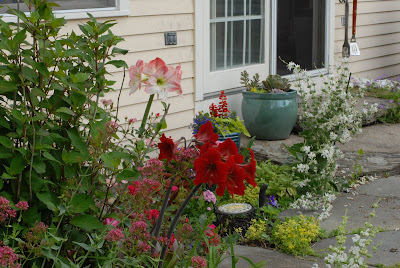 It can be as simple as purchasing an amaryllis bulb kit at a local nursery or something more sophisticated like a bulb garden that can be ordered from a supplier like White Flower Farm in Litchfield, CT. http://www.whiteflowerfarm.com/ It’s not too late to place your holiday order. This is a ready-to-go gift. All they need to do is add water. When you give people bulbs, often you’ll receive a call or a photo when the empty pot suddenly sprouts a fragrant bloom. Many varieties keep on flowering year after year if you take care of them properly. Folks we gave amaryllis bulbs to seven years ago still give yearly reports. My ‘lucky moment journal’ for December 3rd is that it rained during the night and now the sun is breaking through the clouds. So with that said, we end with the inspirational thought for the day by Gertrude S. Wister. “The flowers of late winter and early spring occupy places in our hearts well out of proportion to their size.” Give the gift of bulbs and light up the rooms of many.